During my last tour of America I became part of an experience that rocked me to my emotional and spiritual core. I have no idea why it happened to me rather than an American, only that I was in the right place, at the right time, and had enough money with me to begin the whole process. For a complete understanding of the event I must go back a little in time. I fell in love with America on my first visit in 1975 and have remained so. 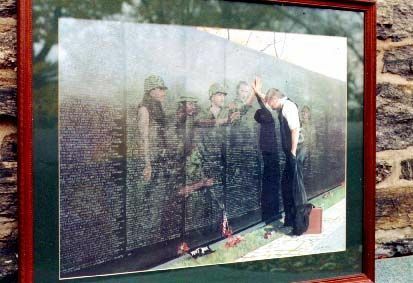 However until this moment I was never able to understand their antagonism towards their sons, brothers, husbands, and childhood friends when they returned from the Vietnam War. Here were young men, many very young, who had little or no choice but to obey their drafting into the armed forces though some evaded it by leaving the country, many more could not. They died in truly terrible ways, (the Viet Cong were extremely imaginative in their methods of killing) yet they and those that survived were reviled and discriminated against when they returned home. Most did not return. Many have never recovered from the mental wounds they suffered, as well as the physical. It rankled with me though I understood that the media and the politicians were mostly to blame. A few days before I left for the US I took a few hours off and switched on the afternoon TV. It was a war film and normally I would have switched channels but the theme caught my attention. The fight of one man against the odds to build a memorial to the Vietnam Veterans. It was called “To Heal a Nation”. I hate weepies, but I sat and cried when at the last, the crowd surged forward to look and touch and cry over the names of those inscribed on that vast black wall. It carries every single name of those who died including the women who are often forgotten. A few weeks later I was in North Carolina with Anna Branche, who many of you will remember. When our double workshop was finished we stayed a few days with our sponsors, the Directors of Light Haven. Feeling restless I persuaded my friend Lyrata to go shopping and we ended up in a small and not very salubrious mall way out of town. In one area there was something that described itself as an Antiques Mart. Never able to resist such places I went in and walked up and down the aisles. It held one of the biggest collections of junk I have seen gathered into one place, and then I came upon the painting. For those of you who have not seen the memorial in Washington, It is a vast semi-circle of jet black stone, stark and uncompromising with the names of the dead cut deeply into its polished surface. The painting showed one part of the wall, some of the names are clearly visible. An elderly business man has taken off his jacket and flung it over the briefcase at his feet. One hand is in his pocket, the other supporting his bent weight is covering the name of his son. The whole figure is a stark depiction of unbearable grief. A grief too deep to express, a loss too intense to bear, a man, one of thousands who had lost a son. We speak often of the sorrow of the Mother, but that of the Father is equally hard to bear, men also feel, men also cry. Had this been all I might have stood and wondered, and passed on but it was not all. Reflected in the shiny surface of the wall, the dead have come close. A young man, the son, still wearing his helmet with his gun slung over his shoulder stands with his outstretched hand covering that of his father. Around him stand or crouch his comrades, an older man, his sergeant perhaps, places a hand on his shoulder and looks, as they all do, out of the wall towards the older man. In the background stands the fainter figure of a young nurse. I don’t know how long I stood and wept, but finally Lyrata found me and comforted me. “Are you going to buy it ?” she asked. “Hell no” was my reply, I am not going to pay $175 to have the heart torn out of me every time I look at it”. So we went back. For the next twenty-four hours I bored everyone silly with my thoughts and feelings about the painting. I found that another of Anna’s priestesses, Avizan, had lost a cousin in Vietnam. I picked up a spy novel to read and it began in Vietnam. I went down to the TV room, there was a film on about Vietnam. I had not realised it but it was the anniversary of the shooting at Kent university when National guards opened fire on students protesting about the war. Every Newscast was re-hashing the Vietnam struggle. A politician who had been Secretary of Defence at the time went on TV to “explain” and to apologise for wrong decisions being made, (a little late) Newspapers carried Vietnam stories or heroism and blunders. The following day I went back to look at the picture, still trying to avoid what was becoming a massive compulsion I asked if they would take $150. They said they would ask. I went back. I dreamt about it, talked about it and finally when they refused to budge on the price I bought it. We talked about how I could get it back to England, we had it packed, the package was so big we couldn’t get it into the car let alone the plane. Finally it went back to Philadelphia by a parcel service. By now the picture had become a living part of me and I cannot stay away from it, but still do not understand why. The answer came in Philadelphia. There were still men who had not ” come home”. Their death had been so traumatic that they had lost themselves in limbo. The antagonism of their own people whipped to frenzy by the media blocked their way, they felt unwelcome, unable to return. For some mutilation had been so great they had been trapped unable to realise that they could be whole. The picture with its powerful emotions locked into the image of the wall was a Doorway through which they could all be brought home to America to rest in peace, honoured and held in esteem. With the help of Anna and S.E.E.D. we prepared for a ritual on the Sunday night. The painting was placed in the East and the West was opened to the Boat of Millions of Years, though I imaged it as a troop carrier, with the Guide of the Dead in uniform. There were twelve of us, all women as it happened and I truly believe, as it was meant to be. I took those names that were clearly visible on the painting and summoned them and asked them to marshal the men behind them. Then with prayer and with love we opened the Doorway and called them home. We laid down a path from the land they had filled with their blood, across the Pacific Ocean to the shores of America. The sound at first was faint, like a distant trumpet, that became the rustling sound of many people standing up, the metallic sound of weapons being shouldered, helmets being straightened, and slowly but with gathering strength the sound of boots marching. Anna called to those whose bodies had been shattered that they were whole and able to move, then spontaneously the women began to sing the Battle Hymn of the Republic. The marching figures responded, this was something they knew and understood. Across the sea they came in an unending line, no longer lost but smiling and on their way home. The women laid down a “Flare Path” of candles from East to West in the Temple to guide them. The Battle Hymn gave way to Spirituals as they sang their men folk home. For a while, we all knew what it was like to shoulder the Vision of Binah, the Great, Unending, Unbearable Weight of Sorrow. The candles were left burning for three days and nights and in all that time the men passed along the “Second Road” guided by the Light. There is a corollary to the story. In New Jersey an elderly Greek lady, the mother of a dear friend, lay in hospital. She complained to her daughter that she had been kept awake all night by lines of soldiers marching through her room. She said they all looked very happy and they were singing …but she hoped they were gone because she could not sleep for it all. The picture is still with Anna, it will not leave America, it is part of the nation whose sorrow it so graphically depicts. That is where it will stay. In July I will offer it to the Vietnam Veterans’ Association, perhaps to the man who fought so hard to build that Memorial if he is still alive. If not then I will give it to the actor who brought his story to the screen with such poignancy. I still do not fully understand why that painting was left in a run down antique market, or why I was the one who came by and could not leave it. Perhaps because of who the School’s contact is, perhaps because it gave me a chance to experience Binah in a way that will stay with me for ever. Perhaps it needed to be a non-American who could stand back and see the Doorway. I only know that together Anna and I and her group of priestesses obeyed an Inner Plane direction to “bring the boys home”. It has left me with a new understanding of sorrow, I have grown by the experience and no longer feel anger at what happened. In a strange way it has cleansed a deep part of me and filled it with Light.